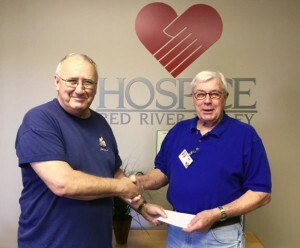 The Detroit Lakes Eagles Aerie 2342 Past Presidents Club recently donated $2,500 to Hospice of the Red River Valley. Jerry Wagendorf, Eagles gaming manager, presented the check to Hal O’Connor, long-time Hospice of the Red River Valley volunteer. The donation will be used to help provide compassionate end-of-life care to those in Detroit Lakes and surrounding communities. “The continued support of the Detroit Lakes Eagles Club is greatly appreciated,” Jane Bartholomay, development officer with Hospice of the Red River Valley, said.